The hour and a half drive was one of the most rewarding so far among all of our day trips. Never could I imagine such windy roads, but they do exist and my parents can attest that they are unbelievable. But after winding our way around, up, and over eight or so mountains we parked and began our hike through the woods to the castle. 15 minutes later we rounded a corner and there she was in all her glory. 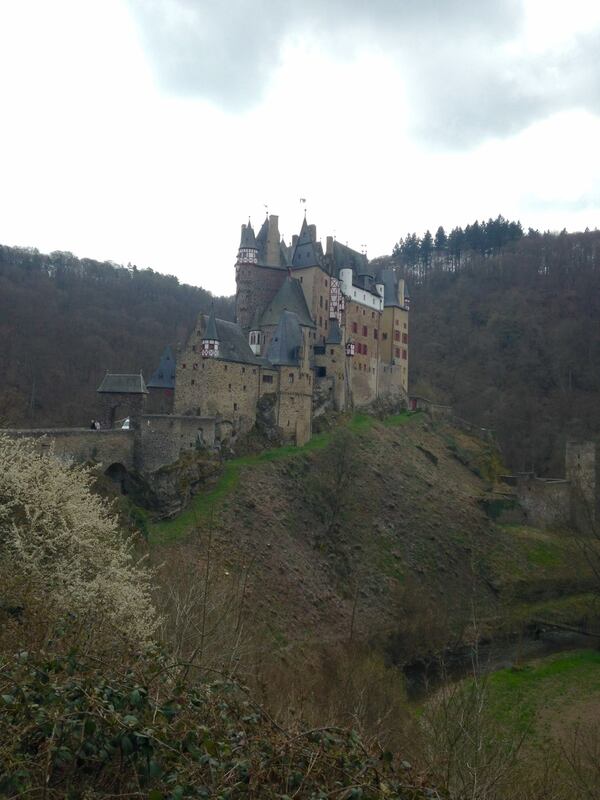 Built atop a shale rock sets Burg Eltz. They do not know when construction was started but the earliest record of the castle dates 1157 and since then has been owned by the same family. In the 1200’s there was a dispute and ownership of the castle ended up in the hands of 3 Eltz brothers—each had a home in the castle so there were three kitchens, three dining rooms and so on. Eventually two of the family lines sold their stakes back to the third family line and ownership has been passed to the eldest son of that bloodline through the current owner, Count Dr. Karl Graf von und zu Eltz-Kempenich. The castle is incredibly well preserved because it only had to defend itself once and was untouched during the World Wars. The family began offering tours in 1913 of the 100 room (80 living, 20 storage) room castle and continues to live (partially) in it today. We were not allowed to take pictures inside the castle, but the pictures below are borrowed from the castle website and postcards we bought. The tour started in the castle courtyard. To get to the courtyard you went through the outer and inner castle gates and past the treasury which was filled with gilt family heirlooms, china, jewels, and my dad’s favorite—antique pistols and rifles. 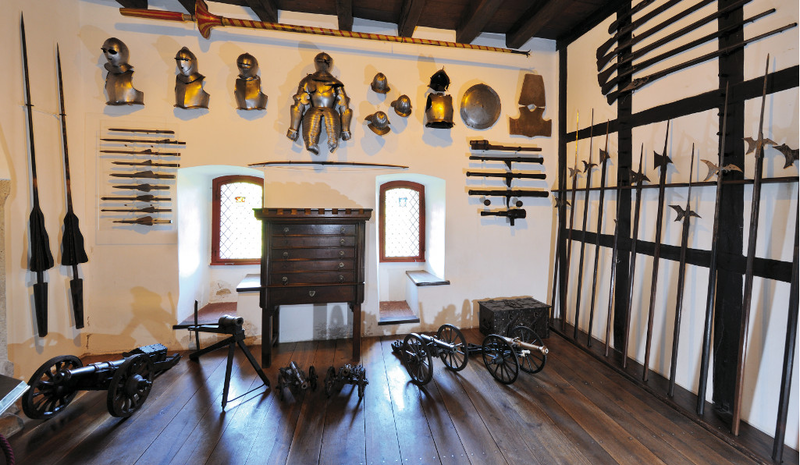 The first room on the tour was the armory. Aside from the obvious medieval armor, notice the window seats built into the wall. This was how all the windows were in the castle so the family could take advantage of the sunlight. From there we went through dining, living, and bedrooms. In the dining room I giggled as the guide said the table and chairs were “new”, they were only from the 1800’s. The whole tour was very interesting. We learned about the family’s history, the castle’s history and advances, and about the artifacts in the castle. For example, the castle had a very advanced plumbing system from the 16th century—flushing toilets! The plumbing system collected rainwater which was then let down to flush toilets and wash dishes. One of the most interesting rooms was the Knights Hall. This was the largest room, which was still small in today’s standards. Rooms were made small to make them easier to keep warm. 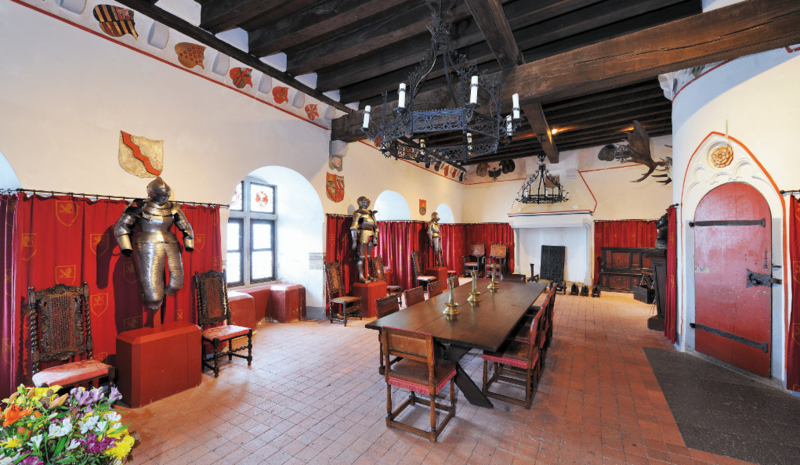 The Knights Hall served two purposes. The first was a dining room, but more importantly it was used as a conference or negotiation room for working with other families. On the wall there were two symbols, a joker which meant guests were free to say what they wanted, and a rose meant that what was said in the room stayed in the room. 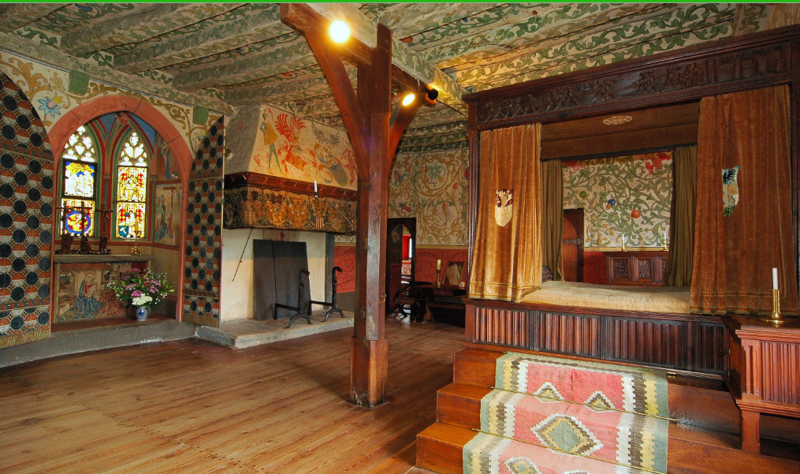 Painted on the walls were the shields of the families that visited for business and shields of distinguished guests. The final room of the tour was the kitchen, and apart from the armory I think it was dad’s favorite. The cutting block was literally a tree stump, and the oven was built into the wall like a pizza oven. Hanging from the ceiling were hooks for hanging food so that rodents wouldn’t get to it, and the servants table was set with wooden plates and spoons. 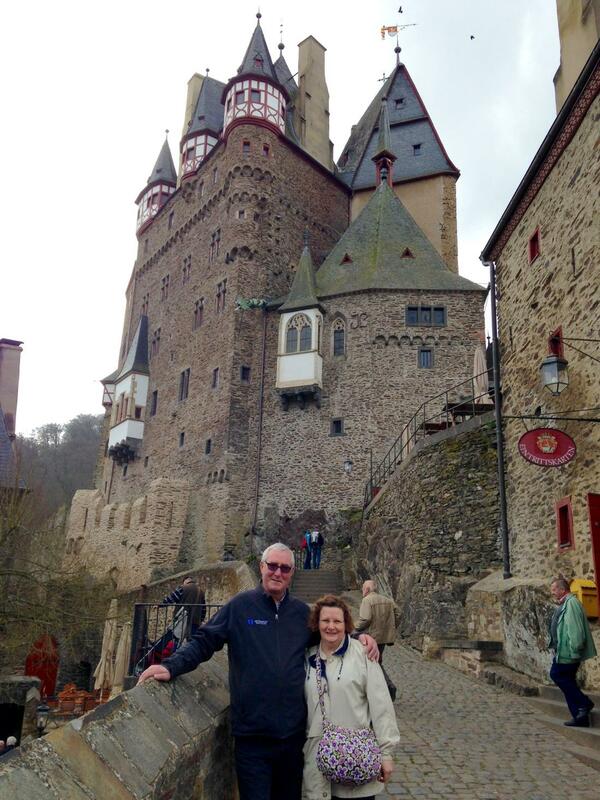 After our tour, and walk back through the woods to the car, we drove to Cochem for lunch. 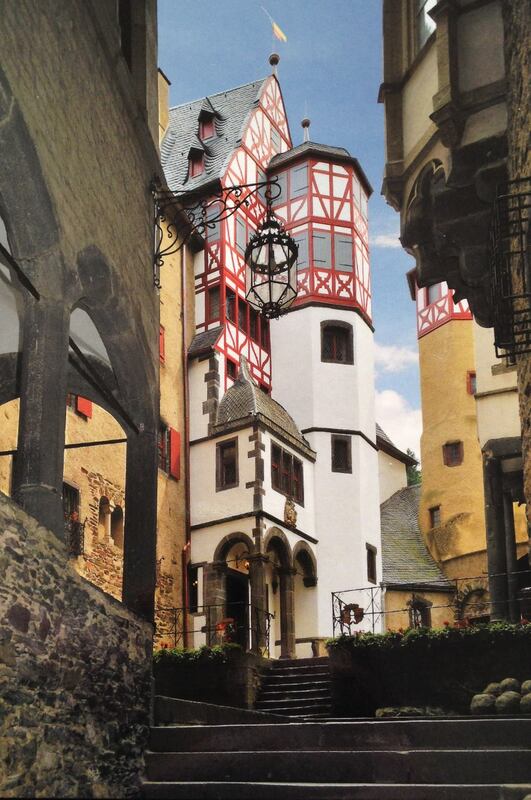 Cochem (and Burg Eltz) are found in the Mosell valley with rich soil for grapes and wine making. The riverbank was basically cliffs covered in grape vines. Our only question was how do they manage to tend the grapes? We rode the sesselbahn, which was somewhat like a ski lift up the mountain, enjoyed the views and relaxed at a café for lunch. We kept it easy and all had bratwurst and apple strudel. Yummmy! 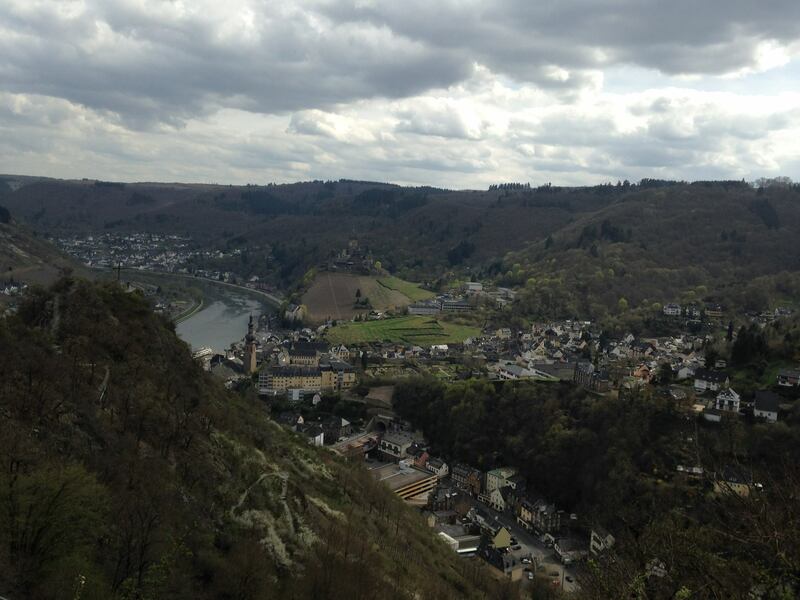 From atop the mountain we could see the ruins of a small castle off to the right, and above Cochem was Reichsburg Castle. This castle is another on the list to see, but after a long day it wasn’t going to happen on this trip. In addition to tours, Reichsburg offers a medieval knights dinner. Thankfully after filling up the ride home was not as treacherous, but it was just as beautiful. All I can say is that it is difficult to focus when there is such beautiful sights around. What an amazing place! Just spectacular to think that castle has been there that long! European history is just so interesting! So glad you got to enjoy it with your parents, Jen! Once again a wonderful adventure that I am grateful you were able to share with your parents and us. The castle was unbelievable and so beautiful. The scenery was spectacular.